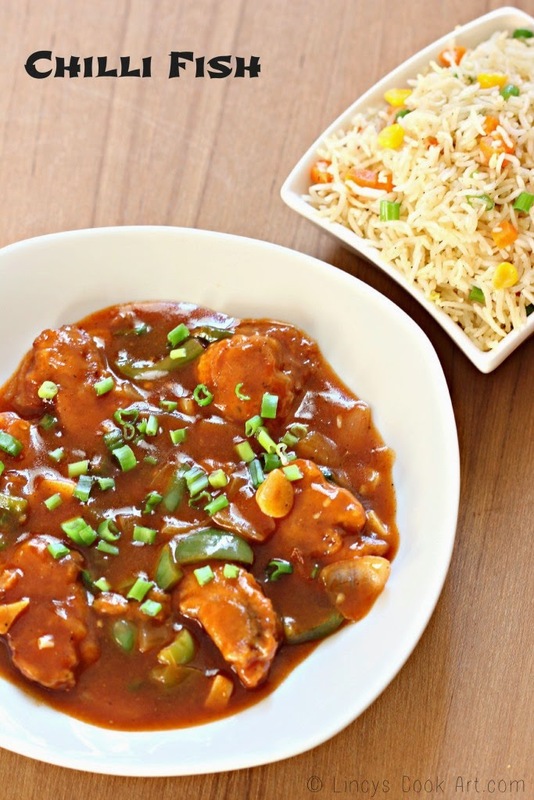 Chilli Fish is a Indo Chinese recipe suits with any Chinese dishes like Fried rice or Noodle as a main course. It is a real treat for the fish food lovers. I like the juicy tender fish inside the spicy sauce. This dish can be prepared as dry, semi dry or gravy form by adjusting the sauces and the corn flour the thickening agent added in this recipe. The fried fish can be served as a starter. Any white flesh fish with out skin can be used to make this dish. I have used here the King fish for this recipe. To marinate the fish mix chilli powder, pepper powder, ginger garlic paste, salt and lemon juice in a bowl and marinate the fish and allow to soak for 10 minutes. Mean while in a bowl mix all purpose flour, corn flour, baking powder, chilli powder, tomato sauce, soya sauce, sugar, salt and water. Mix well as a semi thick slurry without any lumps. If you drop the batter from spoon it has to drop. Batter should not be thick or thin. Dip the marinated fish inside the batter and fry in hot oil till crispy and golden brown. In another pan heat oil and add the onion, green chillies and garlic and cook till the onion becomes transparent. Now add the capsicum and cook till white blisters starts to appear on the skin. Add sugar, salt, chilli powder, tomato sauce, soya sauce and mix well. Dissolve corn flower in 1 cup water and add and stir continuously. Once the sauce starts to thicken add the fried fish and mix well till the gravy coats well and thickens. If needed add a teaspoon of oil and cook well till the floury taste leaves. Garnish with chopped spring onion and serve hot.